Google Chrome is always updating automatically in the background. When it updates, it leaves the files for the old version behind. These files let you rollback your current version to the previous one. Here’s how to delete or backup the previous version of Chrome files. Google Chrome is always updating automatically in the background. When it updates, it leaves the files of old versions behind. These files let you rollback your current version to the previous one. Although we’re not talking about gigabytes of wasted space like iTunes backups, if you’re like me it’s a feature you’ll probably never use. Here’s how to delete or backup the previous version of Chrome files. First, make sure you have Hidden Files showing. Click Start and type: folder options into the Search box and hit Enter. The Folder Options window comes up. 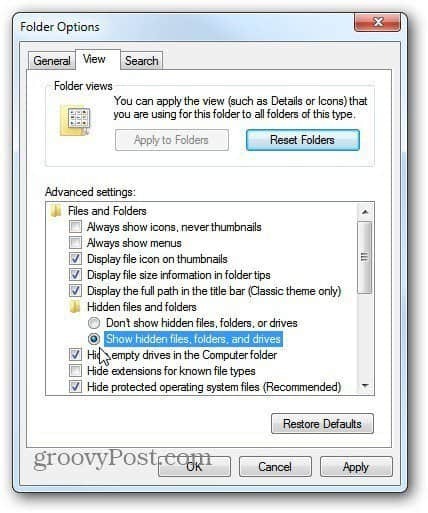 Select the View tab and check Show Hidden Files, Folders and Drives. Click OK. Hold down Ctrl on your keyboard and highlight the previous version number and the old_Chrome.exe icon. Click Delete. Or you can backup each version on a network or external drive. Then, if you need to go back to a previous version for any reason, you have access to them all. Here I was able to save 90 MB of space. This is handy if you like to keep your drive as clean as possible and eek out every last sector of space. 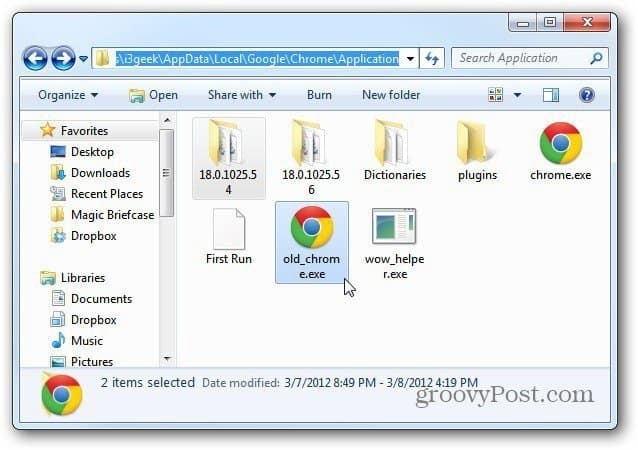 Or if you want a backup of every Google Chrome version. This is a geeky trick, but it’s why we’re here right? Eh just type %appdata% in the search field, no need to show or hide folders ..